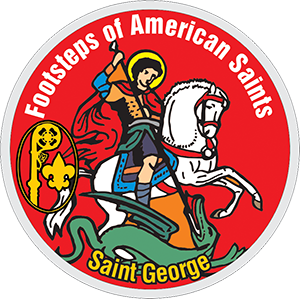 The Diocese of Gaylord provides the opportunity for all youth to earn beautiful patches while doing activities to enhance their faith. These activities, promoted by the National Catholic Committee on Scouting, are available to interested youth and adults, Scouts or non-scouts, Catholic or non-Catholic. This is a great way to invite all of the scouts in your troop to participate in an activity together. Contact the Diocese of Gaylord for information on how to begin. These activities include: Rosary Series, Marian Series and Footsteps of American Saints. The first activity in the Rosary Series describes how to pray the Rosary and each of following activities in the Mysteries of the Holy Rosary. A beautiful 5 inch patch is available for each activity. The Rosary has five activities: Pray the Rosary; Joyful Mysteries; Luminous Mysteries; Sorrowful Mysteries; and Glorious Mysteries. Check out this link for more information or contact the Diocese for assistance. Each activity in this series examines one of the nineteen Marian Feasts Commemorated in the United States, focusing on how and why the Church has honored Mary for more than 2,000 years. A beautiful 3 inch patch is available for each activity. This is a series that encourages youth to learn about individuals who have shaped the landscape of Catholicism in America. These honored individuals are Saints, or are being considered for Sainthood. A beautiful 3 inch patch is available for each activity. Feel free to contact the Diocese for assistance, materials, or patches.